Announcing Edison 2010-12: Privately-shared experiments, Facebook Connect, and more! I am very pleased to announce the following new Edison features. While it's still early days, these are important steps on the way to my vision of a comprehensive Think, Try, Learn platform. A huge thanks to my early Edison users, and to the folks who helped make the release happen: Andy O'Shea, Zinj Guo, Liza Cunningham, and Graham Westerlund. Please let me know how you like them. 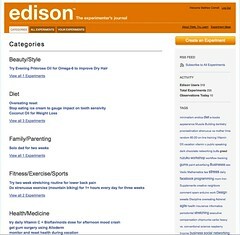 If you haven't tried Edison yet, then give it a shot - it's free! As always, contact me if you have any comments, questions, requests, or bugs to report. 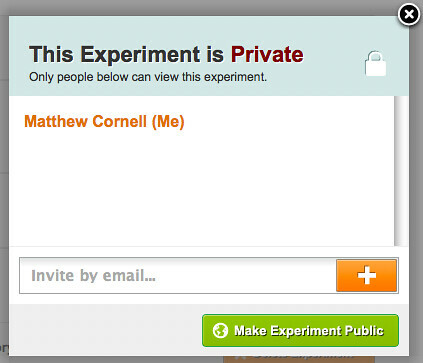 If they choose to participate, you invitees can log in to Edison and view and comment on your experiment. To remove an invitee, click on the gray "x" next to his name. When you close the popup you'll see the sharing button has changed color and icon to show the new visibility setting, . 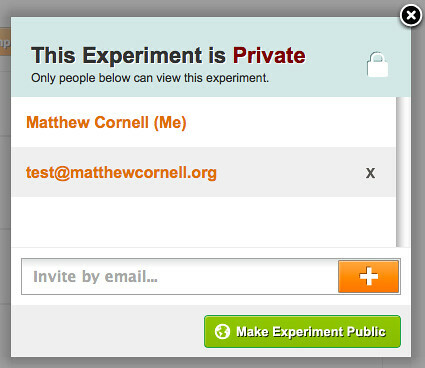 If you're an an invitee viewing an experiment that's been shared with you, you can click the sharing button to see who else has been invited. Because you're not the owner, you cannot add or remove people. For privacy, you can only see their Edison usernames and not their email addresses. 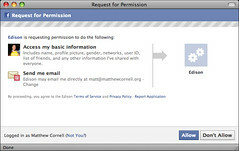 This window is a secure connection coming from Facebook, not Edison, so we never have your login details. At that point you can get started browsing experiments, commenting, and starting your own. As requested by our users, we've added the ability to switch an experiment's state between "Running" and "Completed." Previously, completing an experiment was permanent. There are two ways to complete an experiment, either by clicking the button or by clicking the "Completed" radio button in the "Status" section when editing an experiment. When viewing a completed experiment, you'll see that the "Mark as Complete" button has changed to with a yellow-colored checkmark. I'm enthusiastic about this feature because it is a tiny step in my strategic plan for the platform, specifically the role of Edison partners. 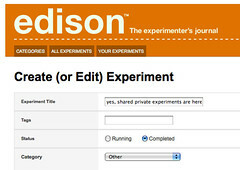 Briefly, the thought is to provide a "white label" feature where partners could set up Edison for their own users' experiments, with one-click buttons that allow users to easily create particular experiments related to the partner's work. 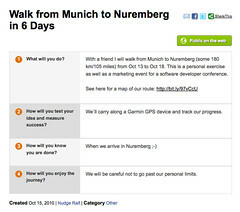 The buttons could be on the site, in blog posts, or in products. This would be a novel and enticing way to create community, not just around discussion boards and blog posts, but around the excitement of actually trying things, getting help and support from others, and seeing if stuff really works. In my case I'll be adding "Try It Now!" links to my You Did WHAT? and Where the ! @#% did my day go? 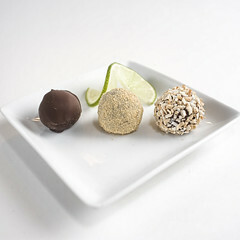 ebooks to encourage my customers to give the experiments a try. My hope is this would help self-improvers move from passive readers to active experimenters. Mindset: For three days try some learned optimism training: When a bothersome event happens, tell yourself it is 1) external (not you), 2) temporary (won't last forever), and 3) specific (doesn't apply to everything in your life). What were the results? Emotions: For three weeks keep a "worry logbook" and schedule "worry time" at the end of the day. Simply write the troublesome thoughts down the moment they happen, and then think about them at the appointed hour. Did their power over you change? Relationships: For a week try this trick for remembering names: Say her name back to her, use it once during the conversation, and repeat it in your head when she looks a way, coughs, etc. If it's important to me you can mentally review her face and name the next day. Did it help? Please let me know if you'd like to put some buttons on your own site for experiments of interest to your readers. In fact, you can simply copy the source above. Finally, we've fixed a but in the Categories tab where the oldest experiments were shown instead of the newest ones. This feature is still experimental, and I haven't figured out how people are using it, if at all.